This is a step-up voltage converter with a UK plug receptacle. » 100 watt maximum capacity. » On/Off switch built-in » Converts 110/120 volts to 220/240 volts. » This product also has a grounded power cord. » Easy to carry & heavy duty casing » Fuse Protected. Weight: 2 lbs. Dimensions(LxBxH): 5" x 3" x 3" Transformer Purchase Guide: Remember to leave at least a 100% slack for the transformer. For the TVs, the power surge margin is 5 times the wattage of the TV. Heating appliances, laser printers and power tools spike when you turn them on. 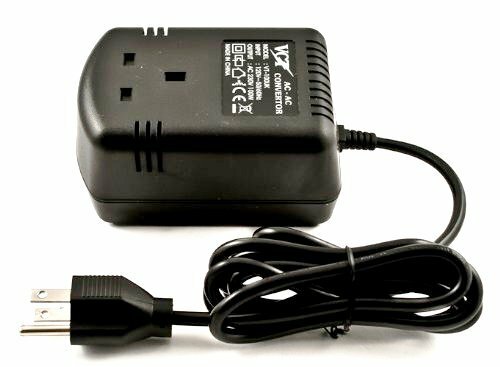 For these products you need to buy a transformer that is at least 3 times the rated wattage of your product.